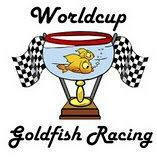 DIY - Goldfish Race fundraiser! gate. Employees pay an entrance fee to buy a fish and participate. Participants are given 1 straw each and are instructed to blow behind the fish and into the water to encourage the fish to swim to the other end of the gutter. The winner gets to keep his/her fish.